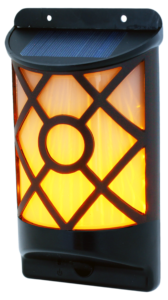 The POWERplus Kiwi is a solar powered realistic flame effect wall light. 66 moving LEDs: looks like real flame. 0.49W solar panel and 2.200 mAh 18650 Lithium battery.